The best way to prolong the life of your full or partial denture is to practice consistent denture care. Properly caring for your dentures can also protect your oral health. Dr. Michael J. Bixby in Red Bank, NJ, offers both traditional and implant-supported restorations. He can provide advice and tips on how to care for your restoration based on its type, your lifestyle, and your oral health. In addition, there are some general care instructions you can follow at home to keep your denture clean and comfortable. While the dentures we craft at our practice are made of strong and resilient materials, you still need to handle them with great care. Dropping your denture can result in cracks or breaks. We recommend standing over a folded towel or a full sink of water when handling your denture to ensure its safety. You should also hold your restoration gently to avoid bending or damaging the plastic or clasps. 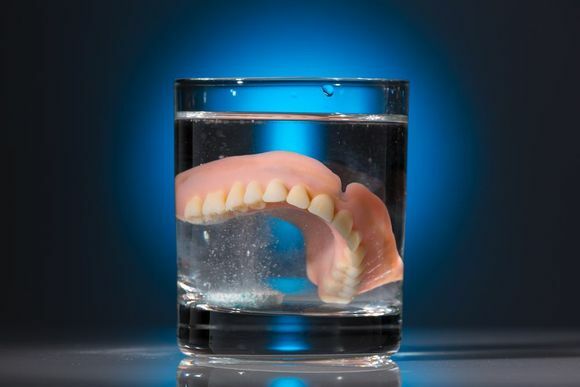 Make sure to keep your denture moist when you are not wearing it to maintain an optimal fit. Keeping your restoration clean is crucial. However, cleaning dentures is different than caring for your natural teeth. Brush daily: While you should brush your dentures, do not use toothpaste. Brushing can prevent stains from forming and remove food and plaque. Make sure to use a soft-bristled brush specifically designed for cleaning dentures. Rinse after every meal: In between brushings, it is a good idea to rinse your dentures to remove debris. We typically recommend rinsing dentures after every meal. Use a denture cleaner: Soaking your denture in a special solution is a good way to keep it clean. You can also invest in an ultrasonic cleaner that uses sound waves to remove deposits. However, ultrasonic cleaners do not replace daily brushing. Keep your mouth clean: After removing your denture, you should use a soft-bristled toothbrush to clean any remaining teeth, as well as your tongue, inside of your cheeks, and the roof of your mouth. Make sure to remove any remaining denture adhesive if you use it. When cleaning your denture, you should avoid abrasive or cleaning materials or products containing bleach. Only use warm water, as hot or boiling water could warp the plastic. Dr. Bixby can give you recommendations on helpful products for cleaning your dentures. Unlike many restorations supported by dental implants, traditional dentures should not be worn while you are sleeping. It is important to take proper care of your restoration when it is not in use. If your dentures dry out, they can lose their shape and need to be refitted. Properly caring for your denture can prolong its lifespan and even protect your oral health. When you are not wearing your denture, place the appliance in a soaking solution or in water. You should discuss the best way for storing your type of denture with Dr. Bixby. Over time, the fit of your dentures can change. If you notice your denture feeling loose or uncomfortable, schedule an appointment with Dr. Bixby. Your restoration may need to be relined or adjusted. We do not recommend trying to fix a damaged dental appliance at home. If something breaks or chips on your restoration, come into our office. Making at-home repairs can compromise your denture and cause more serious and costly issues in the future. Denture patients should attend regular checkups with Dr. Bixby to ensure their restoration continues to fit properly. During this appointment, we can professionally clean your appliance and evaluate your overall oral health. If you have questions about caring for your dentures, contact our office online or call (732) 224-1160 today.